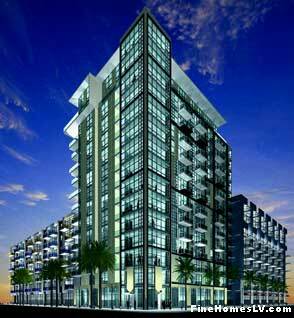 Juhl Las Vegas condo in downtown Las Vegas, Nevada is nearing summer residency. The mixed use real estate development has six loft type buildings. The home owners can enjoy Juhl’s amenities which include a doorman, gated underground parking garage, two story fitness complex, two story fitness center, 24 hour security and a rooftop 75 foot luxurious swimming pool and spa. Residents can enjoy the nearby the World Market Center, Fremont East, World Jewelry Center, Fremont Street Experience and the Smith Center for the Performing Arts. Juhl Las Vegas condos topped off the 15 story downtown high rise mixed use development. Juhl real estate is a $170 million project by CityMark Development from San Diego. First residents to move into the nine story midrise units and 15 story high rise units should be near May 2008. Juhl Las Vegas will include 13 live work condos and 346 unit high rise. Condominiums for sale will start in the high $400,000s. This development is expected to add vitality to the neighborhood. Juhl Las Vegas mixed use real estate downtown development announced that it topped off its mid rise residential building. Juhl Las Vegas is located downtown Las Vegas, Nevada on third street. The retail and condominium project first topping off milestone has been completed for one of the six buildings. The nine story building concrete roof deck will be poured today according to CityMark Development. The city of Las Vegas is looking towards Juhl for bringing new vibrance and development to the revitalization of downtown Las Vegas. This topping off is a major milestone of many to come.